This is not a post about a book. It is a post about a dog – a little dog who meant A LOT. ‘When a Little Means a Lot” was the working title I’d given to my book as I wrote it. 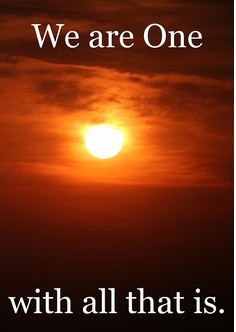 Of course, in the hands of my publisher, the title morphed. It became know as “that give a little book” around the office and the name stuck. Turns out that original title perfectly describes how I feel about my little dog Ruby who came into my life for a brief time and touched me profoundly. It also describes Ruby’s appreciation for every little kindness shown to her. Writing about Ruby is difficult, but it’s important because I’m going to ask a favor of you on her behalf. For Christmas this year, I want to honor my beloved Ruby who died September 3rd. 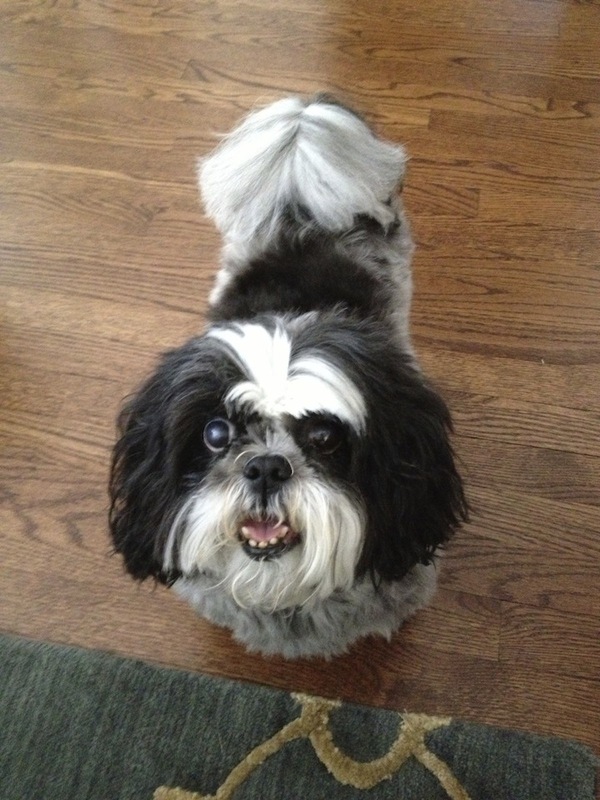 Ruby was a Shih-Tzu – a puppy mill slave breeding mama who lived in a cage for the first 7.5 years of her life. When she came to me, she was mostly blind due to an entirely preventable eye condition, had survived mammary cancer and had few teeth left. She had PTSD and arthritis down the length of her spine. For nearly 8 years, Ruby had been bred for profit by people whose lack of humanity is very difficult for me to understand. Ruby lived with me for just over a year. She embodied gratitude. She appreciated every single opportunity to experience and enjoy the world for the very first time. She had surgery that gave her more vision in one eye for a period. During that time, she loved watching cars go by on a nearby busy street. When her little bit of sight faded, she loved listening to children playing. She loved riding in the car and going for walks – walks that were so slow that it sometimes felt like we were hardly making forward progress. Ruby didn’t just stop to smell the flowers, she stopped to smell everything. If we went out without her, Ruby regaled us upon returning with a happy dance that was pure joy. Ruby never made a sound for the first months she lived with me. In fact, I was afraid her vocal cords had been cut. Over time, as our bond and her trust grew in leaps and bounds, we found her voice, and when she felt especially good she’d sing with me. Ruby found her inner wolf. Ruby had learned how to be a dog. Her ability to love, be joyful and even peaceful despite her despicable life at the puppy mill was nothing short of miraculous to me. She was a beam of love and light every day she lived with us. She enriched our lives immeasurably. To honor Ruby and all the other puppy mill slave mamas breeding for the profit of others, I’ve made a contribution to The Puppy Mill Project that works to shut down these horrid operations. I hope that Ruby’s story will inspire you to donate to The Puppy Mill Project as well and that you will feel good even for a moment knowing that you’re helping to eliminate the worst abuse of dogs who only know how to love. That moment is Ruby’s and my gift to you this year. P.S. Please know that virtually all dogs sold in pet stores are the products of puppy mill slave mamas. DO NOT buy a dog at a pet store. For more info, go to The Puppy Mill Project. If you believe that we all come from the same place and are comprised of the same stuff of the universe, then giving is a no-brainer. We give because we have and others do not. We give to create opportunity for everyone to realize his/her potential. We give because we are they and they are we. 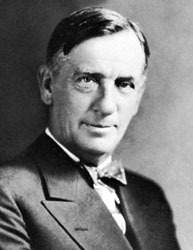 From Wikipedia: Edgar Albert Guest (August 20, 1881, Birmingham, England – August 5, 1959, Detroit, Michigan) (aka Eddie Guest) was a prolific English-born American poet who was popular in the first half of the 20th century and became known as the People’s Poet. Every kid deserves a shot at wearing a graduation robe! 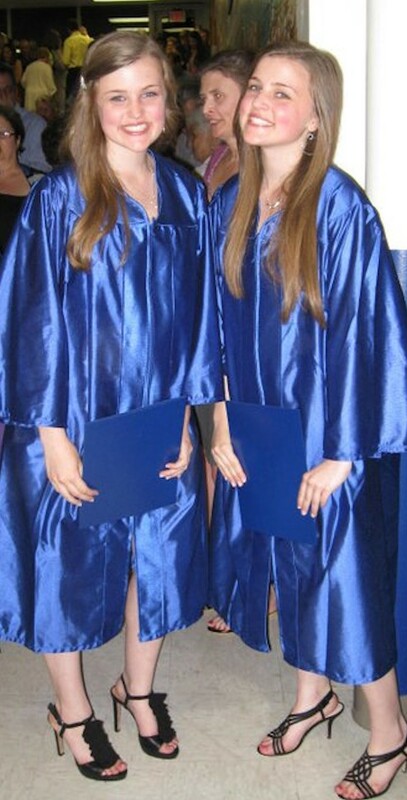 These are my “babies” graduating from 8th grade last year. They were born prematurely and as babies were so prone to getting sick I don’t know how they would have survived measles! Rotavirus made them so sick, I nearly took them to the hospital. Ditto 2 rounds w/pneumonia. Today, kids don’t need to suffer from rotavirus or pneumonia! I want every parent’s child safe from the deadly 4: polio, measles, pneumonia and rotavirus. Sadly 1 child dies every 20 seconds from one of these four entirely preventable diseases. That’s 1.5 million kids every year, or half of all the kids who enter kindergarten each year in the US! 1 in every 5 kids around the world lacks access to these critical vaccines. Please help them get a Shot@Life! It’s so easy! Just sign the pledge that will urge Congress to maintain funding to vaccinate kids in developing countries OR donate to vaccinate a kid or several! It’s just $20 for each child. That’s a $20 well-spent, don’t you think? DID YOU IMMUNIZE YOUR CHILD(REN)? I did. It was not easy or fun since it felt as though I was hauling twin premie babies to the pediatrician’s office every other day. But you know what? All I really had to do was strap them safely into the car seats and drive 2 miles to the doctor’s office. Even allowing for doctors running late, the entire affair usually took under an hour. Millions of mothers around the world are not so lucky. My children’s right to be immunized was never a question. I took for granted both the opportunity and access to immunize my babies. I made the routine trips without ever thinking how lucky I was that my precious babies were going to be safe from some of the most common and deadly diseases that still pervade so many areas around the world. I took for granted what all parents want for their children: for them to be well. 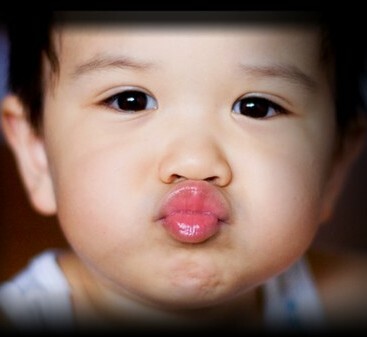 All of a child’s opportunities in life rely first on his or her being well enough to pursue them. 2) Raise funds to help immunize millions of kids against polio, rotavirus (which causes deadly diarrhea), measles and peuemonia. WHY IMMUNIZE KIDS THOUSANDS OF MILES AWAY? In addition to the fact that access to vaccines that protect against entirely preventable diseases is a human right, there is another important reason to support immunizing poor kids. Immunize children = rates of child sickness and mortality decline = lower birth rates = mothers better able to work + lower medical costs to treat illnesses that create debt and deplete family resources + children more likely to attend school regularly = family incomes increase = community prosperity increases = civil conflicts caused by the desperation of poverty decline = more peaceful communities, nations and world. This is the truth. Many economists, sociologists and policy makers agree that investing in children’s health in developing countries is an investment in national security. YOU CAN HELP and IT’S INSANELY EASY! 1) Sign the Shot@Life pledge that urges the U.S. Congress to maintain funding in the federal budget that gets kids immunized. 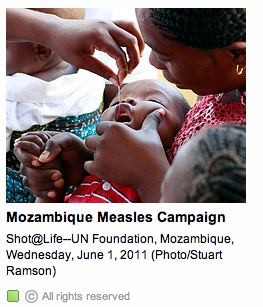 2) Donate $20 and protect a child against polio, rotavirus, measles and pneumonia! 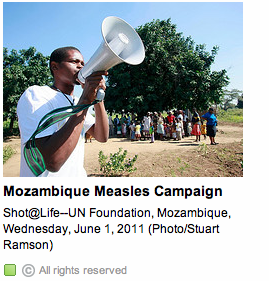 3) Spread the word to your friends, family and colleagues about the Shot@Life campaign. THIS is an INDISPUTABLE OPPORTUNITY to CHANGE the WORLD – and WE NEED YOU to MAKE IT HAPPEN! Just a few minutes and/or a few dollars to give a kid a Shot@Life will do a world of good. Give a Kid a Shot for My Birthday! I need your help to immunize 1 child for every candle on my birthday cake! to make it to kindergarten. If you have kids, you probably remember the seemingly endless stream of visits to the pediatrician’s office for the next round of vaccines in that first year. I remember one appointment when my itty bitty twin baby girls each got 3 shots!! Oh, the fussing, the crying, the squirming – and that was just ME! Fortunately, daddy had a stronger constitution for these things. Still, I knew we were lucky to suffer through those trips to the doctor. I’m backing the UN Foundation’s new campaign Shot@Life. The campaign aims to immunize children in developing countries against 4 of the most common and deadly childhood diseases: polio, rotavirus, pneumonia and measles. I am thankful every single day that my beautiful girls made it through their early childhood safe from diseases that used to cause grave illnesses and deaths not so long ago in the U.S and other developed countries. at the rate of 1 child every 20 seconds. This is a devastating fact on many levels. Parents lose precious children who didn’t get the shot they deserved to reach milestones our children passed through joyfully and safely. 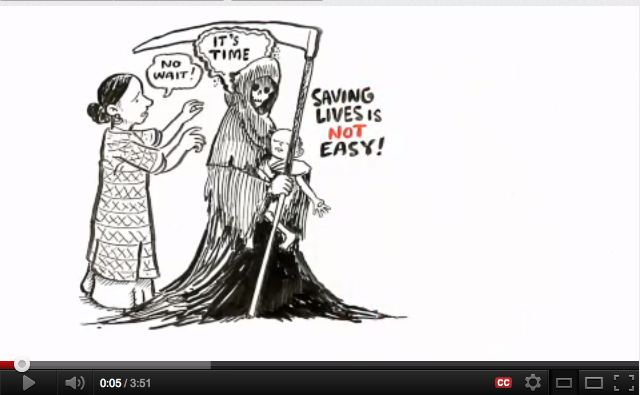 Why immunize kids in developing countries? A child’s death takes a terrible economic toll on families. Some who had made it out of extreme poverty lapse back in because of medical bills they cannot pay. This economic toll is destabilizing to communities and ultimately nations. As a matter of fact, immunizing children in developing countries is ONE OF THE MOST COST-EFFECTIVE WAYS TO ACHIEVE A MORE PEACEFUL WORLD. It is also an extremely effective way to help families life themselves out of poverty. Healthy children can go to school and their parents can go to work. It makes a tremendous difference to the wellbeing of the family and their prospects for prosperity. 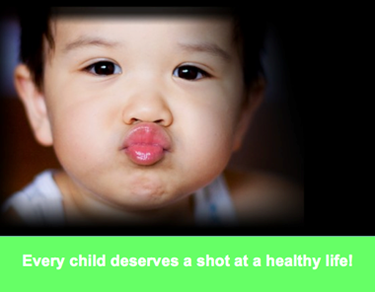 And in the end, every precious child deserves a shot at a healthy life, don’t you think? I am proud to say that I am a champion for the U.N. Foundation’s new campaign Shot@Life, which will immunize children in developing areas against pneumonia, rotavirus, measles and polio. Together, these diseases cause 1 child to die every 20 seconds. Immunizing children in developing areas of the world is one of the most cost-effective ways to address extreme poverty and improve peace around the world. Here’s how it works. Civil wars can destabilize international markets, results in thousands of local deaths and often require intervention by developed nations. This is not an exaggeration of what happens when children get sick from preventable diseases. These diseases ravage children, families, entire communities and ultimately nations. The amazing news is that we KNOW HOW TO STOP THIS VICIOUS CYCLE! doing one or all of several things! 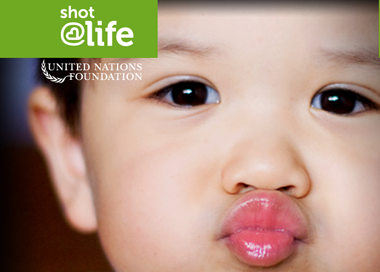 First, please sign the Shot@Life pledge, which demonstrates your support to our government for continuing to fund the immunization of children in developing areas. Next, you can spread the word to your friends, family and colleagues to join the campaign to get kids immunized! Every single voice will count in making this campaign successful! Finally, you can make a direct contribution or hold a Shot@Life fundraising event to insure that children receive the critical vaccines. Just $20 gets 1 child fully immunized. And if all of the above doesn’t make you want to support the cause immediately, did it for this little guy, who deserves a shot at a healthy life. Infrastructure provides access to the services, commodities, and income opportunities that sustain and enhance life for the poor. Roads and bridges lead to schools, to health care, to markets for buying and selling. The poorest areas around the world are also those that are most remote and isolated from the resources we use and take for granted every day. The massive gap in infrastructure between developing and rich nations perpetuates cycles of poverty by forcing the poor to expend massive amounts of time and energy simply to survive. Imagine spending hours every morning carrying a barrel and walking miles to the only reliable source of clean drinking water in the village. 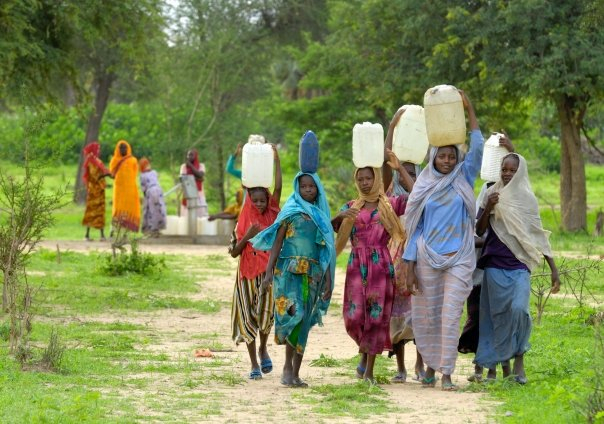 Imagine walking back carrying a full barrel of water on your back or your head. Imagine a 3-hour walk to and from the nearest clinic to get modern medicine for your sick child – rather than hopping in your car for a quick trip to Walmart or Walgreens. Imagine not knowing how to give that medication to your suffering child because you never attended the nearest school, half a day’s walk away, so you cannot read the label. Imagine your children walking 2 hours to and from school each day. Imagine wondering if they will have to wade across a 3-foot rushing stream to get home today because it rained heavily in the afternoon, and water now runs over their path. Imagine saying goodbye to your husband as he leaves for the two-week expedition that is required to haul a harvested crop to market. Imagine watching helplessly as your wife lies wasting away in bed dying, possibly from malaria or AIDS or from a simple infected wound that went untreated and infected her bloodstream. Imagine having no medicine, no doctor, no hospital, no comfort within reach. These are daily realities for the extreme poor. Little Bamchamlak is 6 years old, and she has accidentally knocked over a pot of scalding water, which burns her severely on her entire arm and upper chest. If Bamchamlak were Bianca, and instead of living in the remote Mauksane village in Gonder, Ethiopia, she lived in Detroit or Houston or Boston, she would be rushed to the hospital immediately and provided intensive care for her burns until she was fully recovered. Instead, the moment that Bamchamlak knocks over the pot of boiling water begins a days-long journey – not to a hospital, but to her Aunt’s village, as her family has no money to get medical treatment, and anyway, there is no hospital within a 2-day walk. Perhaps the Aunt will be able to provide some help. So Bamchamlak, with her severe burns, and her father begin their trek, which takes 2 days to walk, then 2 days by bus, then another day walking. But to make that trek Bamchamlak needs to be transported across a broken bridge – by rope. Men line up on either side of the 240-foot long bridge, which spans the Blue Nile 50 feet below, and hold a rope across the 20 feet of missing bridge separates them. People, animals, and parcels are tethered to the rope and pulled across the divide by the men. With her burns, Bamchamlak cannot be tethered directly, so she is placed in a large sack, which is tied to the rope and pulled across. After the terrifying crossing there are still days of travel to reach her Aunt’s village. Unfortunately, Bamchamlak’s aunt is unable to do much for her burns, so the little girl makes the reverse trek home. Over time, scar tissues pulls her chest and upper arm together while her lower arm is locked in a 90 degree angle. She is unable to extend her arm at all. Now, Bamchamlak will be considered a burden to her family and in her village where women conduct a great deal of physical labor in and out of their homes. In her current state, in her remote village in Ethiopia, Bamchamlak is considered severely handicapped. Her lifelong prospects have been made bleaker than they were at her birth. Bamchamlak’s is a true story, but with a much happier ending than one might expect. Lack of infrastructure, combined with grinding poverty, turned Bamchamlak’s burn into a potentially lifelong grave disability. Fortunately for Bamchamlak, a group of determined westerners were headed her way to fix that broken bridge. Along the way, they also managed to fix Bamchamlak’s broken body. In September 2004, National Public Radio aired a story about senior citizens retiring to countries in Central America in order to stretch their retirement nest eggs. The reporter interviewed a woman who had moved with her husband to Nicaragua’s Pacific coast, where she said, “Our Social Security is much more than enough to live quite well here.” The reporter described the retirees’ $100,000 two-bedroom bungalow situated near a clubhouse, pool, and the ocean. Later in the interview, the retiree mentioned that her housing development funds a local health clinic; still, I’ve never forgotten the image conjured by her description of her maid swimming across the river, potentially risking her life as the river is sometimes too dangerous to cross, to a job paying less than $3 per day. I’ve never stopped thinking about building a bridge across that river. In international dollars, or at “purchasing price parity,” which equalizes the currencies of different nations in order to provide a true picture of the relative strength of world economies and levels of poverty, Nicaragua’s gross national income per capita was $3,580 in 2005. That means the average Nicaraguan lived on what $3,580 could purchase in goods and services here in the U.S. that year. Imagine living for a year in the U.S. on $3,580. This is desperate poverty. Fifteen months after I heard the story about retirees in Nicaragua, I was listening to Worldview, a program concerning global affairs that airs on my local public radio station. That day, the show’s host, Jerome McDonnell, was interviewing Ken Frantz about his organization, Bridges to Prosperity, and its construction of footbridges in remote areas of developing countries. At some point during the interview, as Ken was describing the many ways a footbridge transforms the prospects for local residents, I had the proverbial light bulb moment. I distinctly remember thinking, “Of course, a footbridge!” I also thought about that maid swimming across the river in Nicaragua to her low-paying job. It occurred to me at that moment that there must be innumerable such projects, technologies, services, etc., – those that inspire that “aha!” that comes when simple logic meets ingenuity, when a big problem meets its match in a single determined and creative mind. I started investigating. I found irrigation pumps, backpacks full of food, low energy light bulbs, llamas, and asthma vans. I determined that these projects relied on everyday donors like me. I quit my job and started to write. It turns out that Ken Frantz, the founder of Bridges to Prosperity, had a similar moment. In March, 2001, Ken Frantz was killing time in a waiting room of a Ford dealership while one of the trucks belonging to his construction company was being serviced. He picked up a December 2000 copy of National Geographic, and it fell open to a picture that brought Ken’s life as he’d known it to a halt and his life’s mission into laser focus. The photo was taken by Nevada Wier who had accompanied author Virginia Morrell on a rafting expedition down the Blue Nile in Ethiopia. The photo showed the sheer guts and determination that people living in the world’s most remote areas must display on any given day just to survive. “I looked at the photo once, twice, three times,” Ken recalls, “and it came to me: What I want to do is repair that bridge.” With 30+ years of experience in construction and development along with his own business, Ken knew he had the resources to do it. In another twist of fate, Ken’s brother, Forrest, had also seen the photo and had the same inspiration. Within just a couple of months, Ken and Forrest made an initial surveying trek to the Sebara Dildiy bridge in Ethiopia. Life here, where most families barely survive on less than US$1 a day, revolves around the market. A good day could bring in enough money to allow a child to go school. But most children stay home to shepherd animals and chase monkeys away from small vegetable plots. Homes are mud huts with dirt floors. Barefoot and tired from a 20-mile trek, the young Ethiopian farmer nimbly descends a line of steep cliffs and jagged black rocks leading to the Blue Nile’s edge. When he finally reaches the base of a bridge nestled deep inside a gorge, he lets out an exhausted sigh. He sets down his heavy basket of fresh bananas, bound for sale at the market, and waits. The Sebara Dildiy looms before him. Only one person can cross the Blue Nile’s broken bridge at a time, making long waits common. Eight men – four on each side of the missing span– tend a yellow rope stretched across the opening. After 20 minutes, the banana merchant slips a loop around his torso. Carefully, he eases himself off the edge of the bridge and for several minutes hangs dangerously, 50 feet above the fast-moving river, as the men pull him across inch by inch. About 50 people cross safely on this day. Falling from the rope–as one man did not long before – means almost certain death. The merchant gathers his goods, which are pulled across the river after him, and begins hiking the last 26 miles to the market on the other side of the bridge. According to Bridges to Prosperity, at the time of this crossing the men who operated the rope shared a charge of 26¢ (or 3 Ethiopian Birr) per man to cross, a huge portion of the traveler’s daily wages, which at approximately $1.75 per day must support his entire family. Goats and donkeys are taken across upside down, their hooves tethered to the rope. Larger animals, such as cows and oxen, cannot be transported across with the rope. Maksane village (area called Maksanet): On the top of a small hill that rises about 100 feet above the surrounding terrain. No electricity, no telephone, no running water (people walk 2+ km to find water in wet season; probably 5 km in dry season), no vehicles….just donkeys. No post office, no nothing…only grass hut homes. No post office, no nothing…only grass hut homes. I would guess size of village and surrounding area at 800 people, but this could be on low side. No one in Maksane has an address to receive mail. There are no roads, but possible to get to by 4 wheel drive from Iste. Just wide trail that is impassable during wet season. No community building. There seems to be a small field for children play and football of sorts. There is also broken grinding wheel powered by one cylinder diesel that is community owned…but is has been broken for years. Corn and other grains requiring grinding must be sent to Arota by donkey. As you can see, in addition to a broken bridge, the village has no infrastructure of any kind, imprisoning its residents in centuries of cyclical poverty. Less than a year after picking up that copy of National Geographic, having acquired the financing, materials, and technology needed for the project, Ken was overseeing construction of a steel truss to span the bridge’s gap. The task required 25,000 pounds of steel, cement, and equipment, which were trekked 26 miles to the building site on the backs of donkeys. With the help of hundreds of volunteers from local villages, the bridge was in place and in business just 10 days later. Following the completion of the bridge repair, Ken made the following comments at a gathering to celebrate. The Nile River is called the Abai River in the Amhara region of Ethiopia. It separates two districts within Amhara named Gonder and Gojjam. “We meet here today to retire an old and very tired rope. A rope that has done its best to do the impossible. Was the impossible the thousands and thousands of people the rope carried to safety on the opposite shore? No it was not. Was the impossible the thousands and thousands of kilos of teff, animal hides, and coffee carried across? No it was not. The rope did much more than that …….it kept hope alive that someday the bridge would be fixed. I know this to be true, you see, for it was the rope that caused the famous photo to be taken and put in the worlds largest magazine, and……it was I that saw the picture of the rope and the hope it represented…….and it was the rope and the people on either end that stirred my heart to act……and that is why my friends that we came here to help. We came to retire this great rope of hope. But, this rope is only one very small part of the story of this bridge. The story as you know, started some 360 years ago when this bridge was first built. 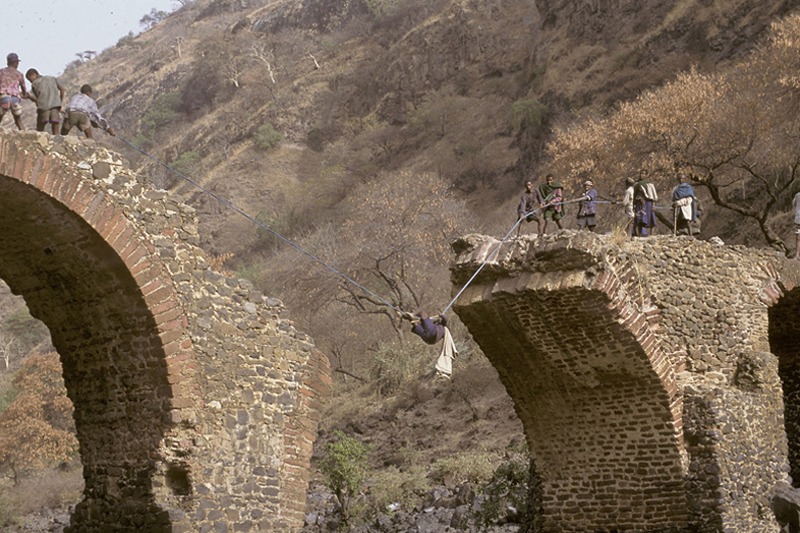 After serving Gonder and Gojjam well for 300 years, the bridge eventually fell into disrepair, and was hence ordered repaired by Emporer Menelik in 1900. The works were headed by a man named Haile Maskal. Both Ras Hailu of Gojjam, Ras Mangasha of Damot, and Ras Gugsa of Gonder sent men to help rebuild the bridge. Some of the elders in Gonder and Gojjam told me stories passed down from their grandfathers of this great endeavor. Hence, it is to them that any dedication of this bridge must be made….for without all of your grandfathers efforts to raise and repair the bridge in 1900, this bridge would be nothing but a memory. Then, about 65 years ago, there was a desperate struggle on this bridge. As the Italian Army of Mussolini came pouring south out of Eritrea into Gojjam and Gonder, a small group of Ethiopian patriots huddled together not far from here to decide the fate of this bridge. Should they risk leaving the bridge standing so as to benefit the armies of their enemy? Or, should they break the bridge so as to force the Italian armies to remain split on either side of the Abai? The leader of this group of patriots, Fitaurari Tamrit must have known the seriousness of the decision he was about to make…..he must have known that if he decided to severe the bridge, it would take years for the bridge to be repaired again. But these were desperate times, and desperate times warranted desperate actions. So, with many men, he started the terrible job of destroying this bridge…..but, not destroying it in anger, but rather in the hope that by doing so, it might help rid his homeland of the foreign invaders. So stone by stone, with the point of the farm plow, the patriots took the middle span apart, trying desperately to save what they could to allow the bridge to be repaired later. Just when it looked like their efforts to surgically sever the bridge were going to succeed, a terrible thing happened. Under the weight of all of the men working on the paper-thin arch, the entire center archway collapsed into the Abai, killing 40 men and their leader, Fitaurari. Did this happen because God was angry about the war being brought to the Abai River? Yes, I think God was mad about the war, but not mad at Fitaurari. I don’t know why Fitaurari had to die. Ken was incredibly moved by the dignity and graciousness of the villagers. Here, he writes of their expressions of gratitude. During the celebration, individual people continue to bring me gifts of eggs…yes eggs. Think of the poorest person you can imagine, one with children suffering from malnutrition, a small hut, a 2 acre farm they till by hand, and torn clothes. These people are bringing me eggs. All thank me, and then give me one egg at a time. I don’t casually send off the gift to others. I help with each egg. By the end of the day, I am given more than 120 eggs. More than 450,000 people live in the area surrounding the Sebara Dildiy bridge repaired by Bridges to Prosperity. Ken estimates the bridge provides 50-100 crossings per hour. Bridges to Prosperity believes that building pedestrian bridges should be a primary effort in helping developing countries eradicate extreme poverty. It certainly makes sense. We’ve already discussed the urgent needs to address hunger, health, and education in order to end extreme poverty; however, for millions of the poorest people around the world, a bridge is desperately needed to access the very services and opportunities we’ve examined. Bridges to Prosperity’s mission is to “empower poor African, Asian, and South American rural communities through footbridge building, thereby advancing personal responsibility, community public works, economic prosperity, and access to schools, clinics, jobs, and markets.” It estimates footbridges are needed in 50 developing countries and that bridges would improve prospects for 1 billion people. The following two elements are the keys to Bridges to Prosperity’s ability to operate as a very lean enterprise while creating tremendous impact: Bridges to Prosperity does not construct footbridges for villagers; it teaches them to build and maintain their own bridges, and some of these newly inducted engineers go on to ripple their work throughout the country. Secondly, board members and volunteers with a shared passion for empowering others donate their time, energy, expertise, and personal financial commitments. Bridges to Prosperity employs only 3 staff: two are located in countries with active bridge building projects, and a director of operations works in the U.S. A 20-member board of directors and volunteers conduct the rest of the organization’s activities – dozens of individuals bringing a vast array of skills to the projects. Many are engineers, Rotarians, and folks in the construction business. Bridges to Prosperity staff and volunteers construct demonstration bridges that provide training to future builders. Those who are trained as “lead engineers” go on to other regions to initiate bridge-building projects and train additional engineers, thereby growing the number of bridges constructed exponentially and creating a wide variety of future economic opportunities for local residents including supplying and hauling materials and providing labor. In order to maximize its impact, the organization spends 2 years in-country providing training and building partnerships with public and private entities that increase the country’s internal capacity to build, maintain, and repair bridges once Bridges to Prosperity moves to another country. By the time they leave, the organization has created a vast pool of stakeholders and future bridge builders. Funding comes from individual donations, Rotary Clubs, the Rotary Foundation, and corporate sponsorship, such as the well-known New York engineering firm, PB (Parsons Brinckerhoff). Bridges to Prosperity does an outstanding job of leveraging its small annual budget ($188,426 in total revenues for 2006) to obtain additional funding to build bridges. Its 2-year budget to build 8 additional bridges in Ethiopia (following the Sebara Dildiy repair) and train 2 lead engineers to continue the work was $215,268. By the end of 2008, Bridges to Prosperity had constructed 55 bridges in 12 countries and developed newer, more cost-efficient bridge technologies significantly reducing their costs per bridge. In 2008, a footbridge in Latin America cost $335/meter to build, and $450/meter in Africa – costs in Africa being higher due to high tariffs, lack of competition, high costs of materials, and poor distribution systems. In a Bridges to Prosperity building project, these costs are born in approximately equal shares by Bridges to Prosperity, the local villages, and other NGO and government partners. Villages contribute all of the labor (typically about 500 man/woman days) and all locally available materials, such as stone, sand and often the wood for decking. Its recently launched “2020 Plan” will result in projects in 20 countries with 200 lead engineers trained by the year 2020 – increasing Bridges to Prosperity’s worldwide footbridge construction to 250 per year, touching the lives of 20 million people. The ultimate goal of the 2020 Plan is to put Bridges to Prosperity out of business, having empowered government bodies, companies, NGOs, engineers and villagers such that its initiation and direction of projects is no longer needed. There it is. A plan to provide 20 million of the world’s poorest people with access to schools, health care, and markets. Each bridge linking the most destitute and isolated people to three of the most crucial keys to prosperity. The rippling effects of this plan are monumental. The ripple of your donation will be the same. Bridges to Prosperity teaches villagers how to construct low-cost, simple, safe bridges that communities and/or local governments can build and maintain. There are several compelling ways to consider the costs/benefits of a single bridge. The following project illustrates this. In May 2007, Bridges to Prosperity taught local villagers how to construct a suspended bridge across the Santo Cruz River near the village of Mezapata in Peru. For years, villagers in Mezapata have harvested coffee beans considered some of the world’s best; however, the work is labor intensive and residents sell their product for only 5% of the final cost to the customer who purchases it in a U.S. grocery store. Villagers earn approximately $2.70 per day – not enough to meet the basic necessities of life and certainly not enough to provide a safety net for times when the price for the beans drops or the harvest is poor. In addition, villagers were spending precious wages to repair the poorly constructed wooden bridge each time it was washed away by floods and preventing them from accessing their work, health care and education. Enter Bridges to Prosperity, which helped villagers construct a 55 meter (180 foot) suspended bridge across the Santo Cruz. The bridge will withstand the annual floods and should reliably serve the community for a minimum of 20 years. The bridge will serve approximately 3,000 people who live on either side. At a cost of $335/meter, the bridge cost $18,425 to construct. Don’t worry, I haven’t forgotten that the title of this book is Give a Little! As a potential donor, you may be thinking that your small contribution won’t go far in helping to build a bridge. The key is to consider the cost of the bridge to an individual user. When broken out this way, you’ll see that a small contribution provides many, many crossings over an $18,000 bridge. For instance, if you divide $18,425 by 3,000 beneficiaries, the cost is only $6.14 per person for the lifetime of the bridge. If you amortize this amount over 20 years, the cost is 31¢ per person/year, an incredibly small investment in providing access to the tools to escape poverty! You can also consider the cost per crossing: if the bridge is crossed 50 times per day (a conservative estimate), the cost per crossing is $18,425 / 20 years / 18,250 crossings per year = 5¢ per crossing! Do you remember that the men pulling travelers across the Sebara Dildiy charged 38¢ per crossing and that this consumed approximately 22% of a traveler’s entire wages for a day? Finally, Bridges to Prosperity estimates that the boost in economic productivity resulting from one of its bridges pays for its construction within 6—12 months. Need I say more? This is a cost-effective, high-return project that you can support with an affordable donation and help profoundly change lives. Despite her devastating injury, Banchamlak’s story has a happy ending. A member of the Bridges to Prosperity crew met Banchamlak in 2002 and arranged for her to have surgery to release the “contractures” caused by her burns, allowing her to use her arm and shoulder again. Banchamlak is now in high school. Life is not easy – she struggles to pay school fees that allow her to stay in a dormitory during the week, as the high school is a 3-hour walk from her village. Still Banchamlak’s prospects for a better life are greatly improved by the bridge that brought hope. [i]. The Rotarian, “Bridging Worlds,” August 2008. Matching Donor Supports Imagine Zambia! Give now and a donor who believes in the potential of Imagine Zambia’s project to launch 30 new women entrepreneurs will MATCH your donation dollar for dollar! Make an affordable donation to Imagine Zambia and you will profoundly change many lives!